(v. 7) But each of us was given grace according to the measure of Christ’s gift. (v. 8) Therefore it is said, “When he ascended on high he made captivity itself a captive; he gave gifts to his people.” (v. 9) When it says, “He ascended,” what does it mean but that he had also descended into the lower parts of the earth? (v. 10) He who descended is the same one who ascended far above all the heavens, so that he might fill all things. (v. 11) The gifts he gave were that some would be apostles, some prophets, some evangelists, some pastors and teachers, (v. 12) to equip the saints for the work of ministry, for building up the body of Christ, (v. 13) until all of us come to the unity of the faith and of the knowledge of the Son of God, to maturity, to the measure of the full stature of Christ. The Pastoral Installation is a worship celebration of the union between a new pastor and a congregation. Like a wedding, the installation becomes a historical marker of the consummation of the covenant between pastor and people. Although the origin of this ritual practice cannot be assigned a specific date, the affirmation and recognition of spiritual leadership (priestly, pastoral, or diakonos) to service the needs of the faith community has biblical precedence in the Judeo-Christian tradition (Numbers 8:5-22; Acts 6:1-7, 13:11-13, Galatians 2:9-10). “Paul and Barnabas were set apart by the Holy Spirit and the elders in the church at Antioch laid hands on them and sent them off” (13:11-13). A pastoral installation is one of the rich cultural paradigms found among most African American congregational churches. The ritual as practiced is a three-fold event: biblical, communal, and mystical. The Bible is central to the ethos of the ceremony. Many of the elements of the installation ceremony, i.e., consecration, prayer, scriptures, etc., are steeped in biblical lore. Second, it is a communal event celebrated within the context of the life of the congregation and the community. Persons from religious, political, and business sectors are invited to participate in the celebration of the new ministry of pastor and people. Finally, it is a mystical event in that the ritual ceremony recognizes and affirms not only the history of God’s involvement in salvation history, but also in the life of the congregation both now and in the future. The ceremony is usually done with great pageantry, like most weddings, because it is done with the expectancy that the pastor and church will work together in Kingdom building for many years. While the congregation calls the pastor and the pastor accepts, the union is not an autonomous decision between two parties, rather a divinely inspired act. I and the congregation I serve have subsequently embraced these principles in our work of ministry. Thus, fundamental to the call of a pastor is the idea that a covenant community under the guide of the Holy Spirit has called its next spiritual leader. When I was installed as pastor of Fifteenth Avenue Baptist Church fifteen years ago, the theme for the occasion was: “Pastor and People: A Union of God.” The installation ceremony ought to be the affirmation and the consummation of the covenant union (marriage) between pastor and people. The Apostle Paul writes this epistle to the church at Ephesus. The letter is catalogued as a prison epistle because it was written during the time of Paul’s incarceration in Rome. The book itself has been referred to as “a short course in ecclesiology.” James Montgomery Boice says of Ephesians, “the Book is about the Church. But the place it begins is with the work of the Father, Son and Holy Spirit bringing it into being.”1 However, God did not just call the church into being. God continues to exercise authority over the nurture, maturation, and the fulfillment of the purposes of God in the world through the church. The antecedent of today’s text is verses 4-6 of chapter four in which the unity of the church has its genesis in the unity of the work of the God Head in the creation and the perpetuation of the church. In verse 6, Paul uses all four times to argue the thorough involvement of the Spirit of God in the life of the church. “There is one body and one Spirit, just as you were called to the one hope of your calling, one God and Father of all, who is above all and through all and in all.” The Greek concept of through (dia) is something that enters one side of a perimeter and out the other side of it. This idea connotes not only the influence but the affect that the Spirit has on the totality of the church. In other words, as the Spirit operates through the body of believers, the Spirit affects the accomplishment of God’s will on earth. Also, Paul says in all! The Spirit operates through (dia) all and in (en) all. The Spirit operates within the perimeter, the boundaries, of each member of the body of Christ. Each member is endowed with the Spirit of Christ. It is to this end that the Spirit has given to each of us gifts according to the measure of Christ’s grace. These gifts, pastor notwithstanding, are given for the purpose of equipping the saints, who are also gifted for the purpose of ministry. word (raa’h) for pastor is shepherd (Jeremiah 3:15) and the New Testament (Greek) word Paul uses for pastor (Ephesians 4:11) is poiemeo, shepherd. The biblical metaphor of pastor is shepherd, one who shepherds the people of God. The pastor is to shepherd the flock of God, which means that all of the qualities, i.e., protector, guide, nurturer, etc., resident in the Good Shepherd ought to be resident in the pastor. The second key word, equip, is also translated as train or prepare in the KJV and NIV. The image of equipping is the setting of a broken bone. This image is consistent with the purpose given in the text for the assignment of gifts – “until the body attains completeness in Christ.” It is the fundamental duty of the pastor to equip the saints for the work of ministry, and for the building up of the body. Also, Paul infers (verse 13) that the construction project of building the body of Christ is to continue until the body reaches perfection in Christ Jesus. Thus, the work of the pastor and the congregation is never complete as long as there are believers who are yet babes in Christ. Finally, the Apostle Paul is clear that the body without the appointment of particular gifts will be fragmented – divided and cannot reach its ultimate end in Christ Jesus. Therefore, in the context of the communal it takes the collaborative work of pastor (shepherd) and people for the effective work of ministry and the building up of the body. The work of the pastor is a daunting task and responsibility because the church, God’s agency in the world, will be ultimately measured by its effectiveness in the world. We must not underestimate the value of a good pastor to the life of the church. The good news in this text is that the church, the call of a pastor, and the installation ceremony are expressions of grace. The Apostle Paul says: “But, each of us was given grace according to the measure of Christ’s gift” (verse 7). Grace, charis in the Greek, is the idea of undeserved favor, freely given to each one who is in the body of Christ. As each church celebrates the installation of a new pastor, they are celebrating a gift of grace. are to equip the saints to build up, work on, themselves. 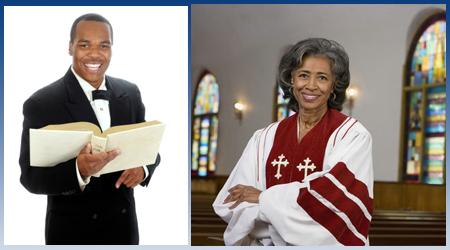 (A) Although many African American churches are endowed with gifted and talented lay leadership, the pastor is the one who has been divinely appointed for the equipping of all of the saints. A good pastor is central to a healthy church, and a healthy church has people whose resolve it is to follow the Chief Shepherd (Jesus). The Apostle Paul appeals to the church at Rome – “By the mercies of God, to present your bodies as living sacrifices, holy and acceptable to God, which is your spiritual act of worship.” The process of calling a pastor must be surrendered to God. Although the calling of a pastor is both political and procedural, it must become a spiritual act of worship for the congregation. Finally, in Paul’s description of the work of grace in the church, he uses inclusive language: verse 7, “each of us” and verse 13, “until all of us.” We must not forget that, regardless of our gifts, we are in this ministry together and ought to be working toward a common vision. I hope my achievements in life shall be these-that I will have fought for what was right and fair, that I will have risked for that which mattered, that I will have given help to those who were in need, that I will have left the earth a better place for what I’ve done and who I’ve been. VII. Ministry of Music - See today’s Worship Unit for suggested music. X. Ministry of Music - See today’s Worship Unit for suggested music. XI. Ministry of Music - See today’s Worship Unit for suggested music. XII. Offering (optional) - See today’s Worship Unit for suggested music. The New Testament word for church (ekklesia) means “to call out.” Thus, the Church is a community of “called out” persons. The good news of God’s great gospel has called us from the shadow of sin to the marvelous light of salvation. In gratitude for our emancipation, we gladly serve as tangible testimonies of God’s invincible love and infinite grace. The Church, which was instituted by and belongs only to Jesus Christ, does not exist for itself but rather exists to carry out a four-fold mission: 1) to exalt the Savior; 2) to equip the saints; 3) to evangelize the sinner; and 4) to enrich society. We can fulfill this mission as called out persons because, on the Day of Pentecost, God poured out the Holy Spirit upon us. The Spirit who raised Jesus from the dead is alive in us, raising us and the communities we serve to new life. I charge you to be a spiritual community of love. You should also be a community where care and compassion abound. The ministry of care and compassion is not simply the job description of the pastor. It is the job description of this entire church. In Galatians 6:2, the Apostle Paul instructs us to “bear one another’s burdens, and in this way… fulfill the law of Christ.” In addition to caring for and showing compassion to one another, never become so insular that you fail to impact the lives of those outside the church who have no advocate, are mired in hopelessness and ravaged by injustice. Be known as a friendly church and a community church. I charge you to eagerly accept the leadership of the pastor. Great leadership is dependent upon willing and consistent “followship.” Trust that your pastor is a person of prayer who desires to lead the congregation according to the perfect will of God. Grant your pastor room to make mistakes. A “mistake-free” ministry would simply be evidence of a lack of courage and vision. Ephesians 5:10 exhorts us to “try to discern what is pleasing to the Lord,” and sometimes we only know God’s perfect will through trial and error. I charge you to foster the creativity and imagination of your pastor. Encourage your pastor to meditate and pray regularly; to appreciate great literature, culture and the arts; and to attend conferences and professional gatherings where her/his gifts for ministry can be enhanced. Then, invite your pastor to unleash her/his sanctified imagination upon this congregation through profound preaching and teaching that illumines the mind, warms the heart, and persuades people to serve the Lord and humanity with all of their heart, soul and mind. I charge you to respect and work with individuals in positions of authority, including lay leaders and members of the church staff. These persons are extensions of the church’s ministry and a manifestation of the pastor’s responsibility to equip the saints for building up the body of Christ. I charge you to be committed to Christian Education. Also, support the work of the church through the faithful stewardship of your time, talent, and treasure thereby extending the reach of the church’s four-fold mission. Put your love of God and the church into action by your generosity. Jesus said that where your treasure is there will your heart be also. Use your God-given skills for the congregation’s ministries and initiatives. Attend the services and meetings whenever possible. Most importantly, pray without ceasing for your church and pastor and live in expectancy of the Lord’s return. I charge you to regularly demonstrate love, care, and compassion for the total well-being of your pastor and her/his family. To honor the pastor’s family is to honor the pastor. Also, encourage your pastor to maintain good spiritual, physical, mental, and emotional health. Insist that your pastor engage in Sabbath rest weekly, seek routine medical care, and take annual vacations. I charge you to strive diligently for unity and peace (Ephesians 4:3). This church should have a peaceful aroma in it. It should be holy ground, instead of a battleground. But do not expect a church free of problems and free of disagreements. Robust dialogue and earnest disagreements are natural features of a covenant relationship. Yet ensure that your dialogue and disagreements never dishonor the Lord. Jesus insists that peacemakers are blessed and are the true children of God. Finally, I charge you to joyously embrace change and never major in minor things. God has united you with your pastor for the purposes of transforming this congregation, community, and even the world. Thus, do not waste God’s time in trivial pursuits. Worry less about the church By-Laws and focus more on the Bible. Worry less about a renovation project and focus more on building up torn-down lives. Worry less about the budget and focus more on God who can supply all your needs. Dream big dreams for God and wait expectantly as God transforms dreams into reality. Always remember that our God is able to do exceedingly, abundantly above all that we can ask or think. For more than twenty centuries across each generation the church has set aside some of her members for special training and preparation. The church elects such persons to positions of responsibility not privilege. They are called to serve the downtrodden and the disinherited. These persons may be apostles, prophets, teachers or pastors. They are called to equip the saints for the work of the ministry, so that the body of Christ will be edified. Therefore, Reverend _____________ on this ___ day of ___ in the Year of Our Lord, ____, I offer the following charge to you. If you concur, when appropriate, please respond, I accept. I charge you in the words of St. Paul to be steadfast, unmovable, always abounding in the work of the Lord, for as much as you know that your labor is not in vain in the Lord. So, do not seek to be more successful; seek to be more faithful. Never take as the aim of your life fortune or fame for neither can keep you near the cross nor lead you to you to your destiny which is the prize of the high calling from Jesus Christ. If you concur, please say, I accept. I charge you to never build obstructions that keep out the faces of the defeated or the cries of the marginalized for as you do unto these you do unto Christ. Never ascend too high to visit those who are on beds of affliction or on cots in padded prison cells for as you do unto these you do unto Christ. I charge you in the presence of God and of Jesus Christ, who will judge the living and the dead, to preach the Word; proclaim a righteous and relevant Gospel in season and out of season. Correct, rebuke and encourage with great patience and through careful instruction. Listen to your flock, work closely with them and pray for them, weep and rejoice with them for they are your charge. As you do this, remember that pastoring is not finely tuned orchestration. Rather it is that calling that requires a willingness to accept the improvisational movement of God. I charge you to never develop disdain for a congregant. Instead, fall in love with these people over and over and over again. Your vocation though also manifested through sacramental acts is above all to spread the love of Jesus Christ. Never tire of that vocation. And when faced with your greatest enemy, humble yourself enough to love them and in this act of humility you will find great strength and victory. I charge you to never take for granted your family, your health, or your personal relationship with God. It is your family that bears you up as if on eagle’s wings in your presence and in your absence; their generosity helps make your work possible. Your health you must safeguard for you know that your body is not your own, it is the temple of God and a dwelling place of the Holy Spirit. And it is your personal relationship with God that feeds and determines all other relationships and it determines the home going destination of your soul. I charge you to always give God your best and be original. God desires to do something significant through this church and through you in this season; not through your predecessors, each of whom had their own charge to keep and God to glorify. God wants to work though you. So, listen to God; even in the silences God still speaks. And do not expect scar-free ministry, for our risen Savior did not obtain this fate. Do not expect a painless pastorate, for Jesus wept over Jerusalem. Do not expect that none will doubt and none will betray and none will be afraid for each of these actions were shown by some who walked with Jesus in the flesh. But do know that this same Jesus promised to be with you always, to never leave or forsake you. Let that be your greatest comfort. I charge you to always remember that this is not your work, it is God’s work! No matter how arduous the days, how exemplary your ministry, or how much you are lauded; this is not about you, this is God’s work. Also, remember, no matter how much it grows or contracts, swims with or against controversial cultural tides, this is not your church, it is God’s church. And last but not least, as your take up this mantle, remember that all of the gifts you have received to serve as a pastor are not your gifts. They are delicate divine deposits. They are the answers to knee-scarring prayers prayed on your behalf. They are the lessons of teachers, the knowledge of colleagues, strangers, mentors and friends. Finally, your gifts are the residue of the struggles of your ancestors from West Africa come full circle! If you agree to always remember these things, please say I will. Accordingly, Reverend ___________by God’s appointment, the people’s affirmation and your acceptance, as an elder in the Church of Jesus Christ, I now announce that as you are installed as the (indicate the placement as pastor of the Pastor Elect, i.e. 4, 5, 6 etc.) Senior Minister of name of the church. Prayer of Installation - If desired it is appropriate at this point in the service for all clergy to collectively lay hands on the new pastor as the prayer is given. Benediction - See today’s Worship Unit for suggested music. * The sample charge to a congregation was written by members of The African American Lectionary team; special thanks to Dr. Brad R. Braxton. The sample charge for a Pastor-Elect was written by Martha Simmons, Creator and Director of The African American Lectionary. 1. Boice, Montgomery, James. Ephesians: An Expositional Commentary. Ada, MI: Baker Books, May 2006.